The Minister tweeted this remarks on Tuesday (22) following his participation in the National event held at the Vidyananda Maha Vidyalaya, Mulliyawal, Mullaitivu, yesterday (21), to declare National Drug Prevention Week. 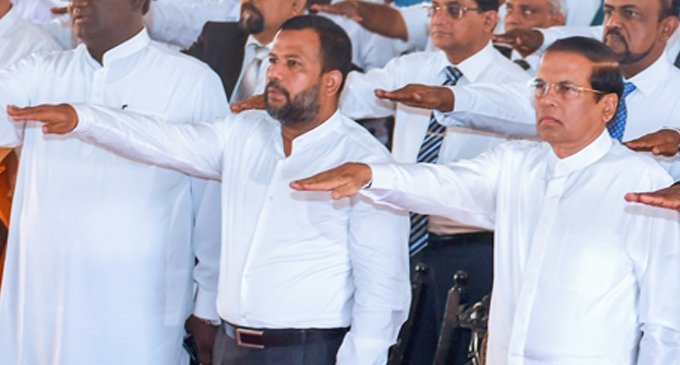 Declaring the National Drug Prevention Week, President Sirisena stated that the course of actions taken during the last four-years against the illegal drug smuggling will be implemented with a new approach from next week. The President emphasised that in any way the Government will not change its decision to impose capital punishment on drug traffickers. During this event President Sirisena officially launched the toll free telephone number 1984 to inform regarding the acts of drug smuggling and related organised crimes. The President, expressing his views further said that according to a request made by him the Government of the Philippines agreed to provide assistance to Sri Lanka to curb illegal drug smuggling and a Philippines expert team is scheduled to visit Sri Lanka shortly to explore the possibility of providing technology consultancy service in this regard. President Sirisena said that the Philippines is a country which was being destroyed due to rampant drug menace and due to the initiatives taken by the President of Philippines it has overcome this challenge. He also said that even though he will not implement some decisions taken by the President of Philippines, will not change several stern decisions taken against the drug traffickers due to the fear of the Non-Governmental Organisations (NGOs). The President further said that even though certain Human Rights Organisations raised their voices against severe decisions taken against drug dealers, yet due to this trauma the damage caused to the country, nation and the future of the children is not properly considered by them and that everybody is responsible for this issue. Information regarding not only the drug dealers, but other parties behind these dealers will be revealed to the country, said the President. The national drug prevention week is activated till next 28th from yesterday with activities in schools from 21 to 25 January. The inaugural ceremony was held under the patronage of the President at Mulliyawallei Vidiyanathan Maha Vidyalaya, Mullathiew, after a pledge was taken on drug prevention in collaboration with 150,000 school children at the schools in Jaffna district during the daily assembly in the morning. President Sirisena is conducting a programme in order to prevent and eradicate drugs which has become a major issue to the whole nation with a special consideration given for the school children naming it as the drug prevention week. Under this, on 21st of January activities will be conducted within the classrooms on drug prevention and on 22nd parents will be invited to school class rooms to brief on drug prevention. On 23rd an awareness programme will be carried out regarding the prevention of drugs and legal matters related to that. A programme will be conducted on 24th, with the participation of the political authority to enhance the anti-drugs campaign. On 25th a programme will take place for promoting drug prevention messages using social media and making the media personal aware of this issue. On 26th programme for carrying on activities of drug prevention within volunteer organizations will also take place. On 27th drug prevention activities will be conducted in religious places and in dhamma schools. In addition, the President said that the best messengers to carry the message to the society are the school children. Therefore, the President emphasised the importance of active contribution of school children for the prevention of drug trafficking campaign. Meanwhile, President Sirisena handed over funds for rebuilding 11 schools affected by recent floods in Mullaitivu and Kilinochchi Districts. As well as, financial allocations were also granted for 13 schools without drinking water facilities in Mullaitivu Districts. Commander of the Army Lieutenant General Mahesh Senanayake handed over the documents related to 264 acres of state and private lands that were released to the original owners. These lands in Jaffna, Mullaitivu, Kilinochchi and Mannar Districts were earlier acquired by the army during the conflict. The Army Commander handed over the documents to the President to release 1099 acres of land belonging to four main Government farms and the President handed them over to the District Secretaries. Ministers Bathuideen, Daya Gamage, Dr. Suresh Raghavan, Governor of the Northern Province, Sri Lanka Freedom Party (SLFP) General Secretary Dayasiri Jayasekera, Angajan Ramanathan and Cader Mathsan, District Secretaries, Provincial Secretaries and Government Agents, Officers of the Army, Navy, the Chief of Defence Staff and the Chief of Defence and Staff of the Army were also present on this occasion.